Like this author’s content? Make sure you join their official Telegram Channel and follow their Twitter account as well to stay informed and up-to-date with all of their works! This is not a clickbait title. The goal of this piece will be to demonstrate how and why the value of Ethereum will eventually drop to zero. This article will be corroborated with facts and sources regarding blockchain as well as an in-depth look at the price action of Ethereum as well as its governance. This article will be broken into different parts under larger subheadings that are accompanied by Roman numerals. The above tweet, which references the BitMex Research report that was published recently, reflects a bullish sentiment for Ethereum which many have also felt recently. The report, of course, noted the massive sell off of Ethereum funds in recent weeks and months by ICO wallets that had been stuffed by investors months prior. This is something that we’re willing to agree with. The price of Ethereum, at this point, is probably no longer impacted by the massive sell off of ETH tokens that were awarded to ICO funds via investors throughout 2017 and the first half of 2018. However, this should be a sign of even worse things to come for investors in the near future. 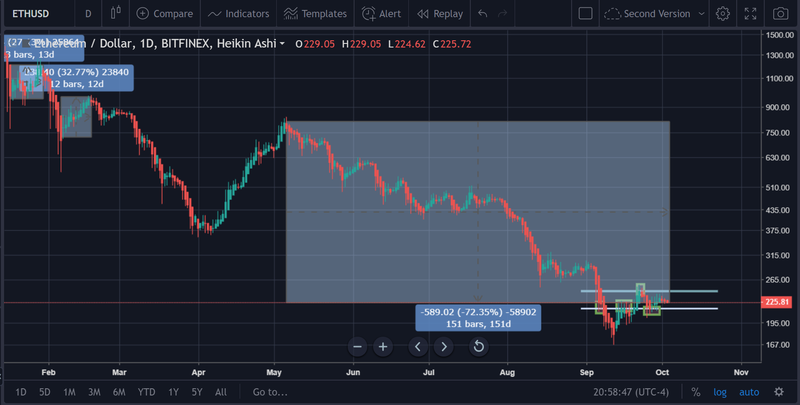 As can be seen in the picture above, the price of Ethereum has plummeted by 72.35% since May 5th, 2018, which was approximately 151 days ago at the time of writing. That’s a great question. One thing that makes Ethereum markedly different though is the fact that it has depreciated more than Ripple, Bitcoin Cash, Litecoin, Bitcoin, and Stellar (its major counterpart cryptos). Below is a chart that compares Ethereum’s steep fall in $BTC, to give investors a better sense of the abysmal price action on Ethereum as of late. 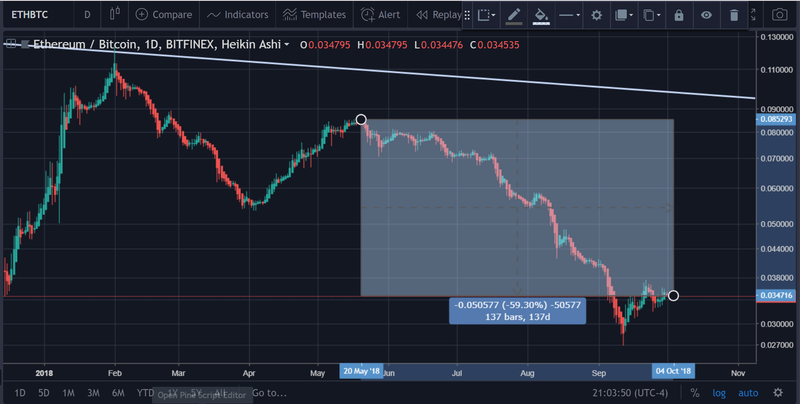 The chart above shows that the price of Ethereum has depreciated 60% against Bitcoin since May 5th. This, too, is larger than that of any of the aforementioned cryptocurrencies which we compared Ethereum to when we looked at its chart. This is, by far, the biggest issue that is plaguing the Ethereum protocol today. In general, there seems to be no firm consensus on how or if Ethereum will be able to scale. Vitalik has put out a number of ideas which, by themselves, are unlikely to sufficiently scale the protocol in an effective manner whilst retaining its decentralized properties. Modern Computing. There is only so much bandwidth that a network is able to hold — especially, on a network like Etheruem, Bitcoin, Litecoin, or even Bitcoin Cash. And this is due mainly to the fact that nodes must propagate the longest blockchain that they have verified and do so constantly. This means that nodes must be able to maintain the entire blockchain itself (which is over 1 TB in Ethereum’s case at this present moment), and also handle the consistent load of downloading blocks and propagating them to the network as well. This is something that scaling may make this endeavor prohibitively taxing for someone using a regular computer. Therefore, the only two results that would resolve this issue would be accepting a substantially reduced throughput from what its theoretical maximum would be or embracing a centralized network where only a handful of nodes may be able to successfully run the protocol. Centralization: This was touched on lightly in point #1, but to expound upon that idea — centralization is not only inherent in expanding the blockchain’s capabilities beyond the point to which your ‘average’ computer/laptop would be able to handle the load, but in switching the consensus algorithm as well. Months ago, Vitalik Buterin assured investors that it was Ethereum’s long-term plan to ensure the scalability of Etheruem by creating a PoS chain. However, the problem with any type of staking protocol is that, at best, it ends up making the blockchain a democratic republic (where nodes are able to vote for other nodes that eventually make the decisions on which blocks are placed where). These networks tend to mirror consortiums more closely than they do decentralized, permissionless networks like what Ethereum proposes to provide. Brain Drain — The fact of the matter is that there are not many “experts” in blockchain technology, let alone on Ethereum’s protocol. This is due to a few factors, but among the strongest of those factors is the idea of ‘brain drain’. This term refers to the exodus of intelligent people from a specific country. However, in this case, we’re using it to refer to the exodus of highly intelligent individuals from a protocol. Notably, on Ethereum, there have been a number of individuals such as Charles Hoskinson whom were invested into the project’s development that have now gone on to pursue other endeavors. In addition, new projects that have cropped up (ironically, some of the ICOs being launched on Ethereum) have dramatically shrunken the field of available blockchain engineers and technicians with the intelligence and integrity necessary to help develop and implement any effective scaling solutions. In-Fighting/Disagreements: As noted by several observers now and in the past, disagreements and in-fighting are what ultimately led to the divorce of the Bitcoin community into two separate factions which are; Bitcoin and Bitcoin Cash. Regardless of what side of the ‘debate’ you’re in on that issue, mostly everyone can agree that the communities would be substantially stronger together than they are separately. Similarly, Ethereum has faced in-fighting of all sorts. Ethereum Classic is and was the first example of such discord within the community and developers regarding the chain’s future direction and philosophy. This, ironically, was yet another instance of brain drain that impacted Ethereum as well. Beyond this split though, there has been intense in-fighting and arguing regarding the proper means of scaling. Some are advocates of Plasma, others prefer sharding, and some are against any proposed method that has been presented thus far. Now, while it is true that the in-fighting has not led to yet another major fork like what we saw last summer (’17) between the Bitcoin and Bitcoin Cash communities, it does threaten to inherently stagnate the progress of the chain in the near future. Vitalik Buterin, the de facto ‘head’ of Ethereum, has been fairly ambiguous in the last few months — going from sounding bearish and pessimistic at times to nearly guaranteeing that the Ethereum protocol will scale. From the proposed roadmap that Ethereum has/had for scalability to the proposals that Vitalik Buterin has made, he has been inconsistent on just about every issue affecting Ethereum. In fact, the only thing that has been consistent in Vitalik Buterin’s statements is that they are consistently inconsistent. While his intelligence and clear talent as a developer and programmer at such a young age cannot be denied, one cannot help but wonder whether Vitalik has the talents to conquer what now appears to be an insurmountable task — creating an effective scaling solution for Ethereum. Despite being well-known and respected in the community, Vitalik Buterin is relatively ‘untested’ in terms of his development and leadership skills. Sure, we will acknowledge that he was and is one of the major founders of Ethereum — we can’t take that away from him. But we also know that there was a blueprint for Ethereum’s creation in a lot of ways. The concept of blockchain already existed (in Bitcoin), proposals had been made already in the blockchain community to create a Turing-complete chain, and the PoW consensus algorithm was something that had already been thought of long before Ethereum’s inception. So, in many ways, we’ve only been able to witness Vitalik’s prowess at taking information and concepts that have already been in existence and bringing them to fruition to yield a chain that has been able to obtain the #2 market cap in all of cryptocurrency, which is no small feat. However, we have never seen Vitalik Buterin conquer a task of this magnitude. As the de facto ‘head’ of Ethereum, he is being looked to as the person responsible for coming up with an appropriate scaling solution. At this point, Vitalik Buterin is under the most pressure, as a blockchain developer, that he’s ever faced in this industry and without a track record of instances where he’s thrived in similar situations, investors are essentially taking a gamble on Vitalik Buterin as well. Again, this is not to state that the man isn’t brilliant — he is. But one cannot help but think that its possible that he does not possess the ability to actually scale Ethereum. The prevalence and permanence of the above issues have reduced investor confidence considerably over time — especially in 2018. Perhaps this is because investors now realize that scalability is not a matter of desire for Ethereum, but more of a mandate to ensure its survival in the long-term. Unlike Bitcoin, Ethereum is not a strictly payment-based protocol. It instead has provided a platform that hosts and sponsors smart contract development. As such, its design stipulates that any executions of the smart contract code function as a transaction on the protocol. This smart contract functionality has enabled a large number of projects to build themselves on the protocol and, at the time of writing, over 1/3rd of all cryptocurrencies are either Ethereum, an Ethereum fork/derivative (like $ETC), or an ERC20 token. While this is amazing, it is also very troubling when considering Ethereum’s failure to put together a cohesive plan for scaling that allows the network to retain its decentralized characteristics without compromising its security and simultaneously because the success of many of these ERC20 tokens is contingent upon being built on a blockchain that is able to fulfill this call of duty. Therefore, if Ethereum does not scale, then it cannot serve its purpose as a cryptocurrency. If it cannot serve its purpose, then what is it worth? And how long will it be before other investors and potential blockchain startups start adopting that same logic and seeking alternative means of launching their projects? In a lot of ways, it seems that projects have begun to adapt this line of thinking, which leads us to our next point. The number of projects that have pivoted on their road maps and decided to launch their own blockchain in lieu of remaining an ERC20 token has grown substantially throughout the course of the year. Notable projects (notable as in large market cap) that have launched their own blockchains (or have announced they’re planning to) include; Tron, EOS, Augur, VeChain, NULS, ICON, Wanchain, Aeternity, Zilliqa and several others. Now some of you reading this probably mentally noted that there are a couple of projects that we named above that stated they were going to move the project from the mainnet before they even launched their ICO. However, there are a considerable number of projects that didn’t. Many theories speculate that lack of confidence in Ethereum’s ability to scale forced the hand of these cryptocurrency projects. They knew that if Ethereum failed to scale, then their project/idea would be doomed to failure as well. Perhaps the mainnet swaps are all marketing ploys and this says nothing about Etheruem at all. Regardless of the underlying reason, the exodus of projects from the blockchain looks bad on Ethereum. This is because it reduces the use case for Ethereum substantially. It reduces it from its promise of being the world’s first decentralized, ‘smart computer’ via blockchain technology and instead relegates it to being no more than a glorified cryptocurrency ‘gofundme’ page for ICOs. And if that’s the case, then the long-term use case for Ethereum (scaling-wise or not) becomes bearish. With such a presumptive article, we would be remiss if we didn’t at least mention a few of the likely counter-arguments that Ethereum believers and bulls may state in objection. This argument is simple, yet potent. Some will argue that, despite what any pundits like ourselves believe, Ethereum is destined to scale. Plain and simple. Those that pose this counter-argument believe that this certainty that Ethereum will scale logically belies a certainty that Ethereum will once again rise in value and perhaps even surpass Bitcoin’s market cap one day. Another major argument that dissenters may posit is that Vitalik Buterin and Ethereum developers have already made strides toward creating an effective scaling solution and that this should be seen as proof that Ethereum is currently on the ‘right track’ to scaling. This is yet another poignant opposition to the assertions made during the body of our argument above. The fact is that, this rebuttal is correct. While protocols such as Bitcoin, Bitcoin Cash, Litecoin, Monero and others are currently functional and in use, most would agree that these projects are not anywhere near their final iterations in terms of technological capacity. Every project appears to be working on some sort of scaling solution that will help make the blockchain itself more efficient or usable among a wider audience. As stated earlier, it was the incessant in-fighting among developers and users on the Bitcoin protocol that led to the separation of two different entities that are known as Bitcoin and Bitcoin Cash. So, it wouldn’t be unfair to state that Ethereum is not too terribly different than any other project in the sphere when it comes to scalability. Again, this is yet another poignant rebuttal to the points that were made in the body of the main article here. Love it or hate it, Ethereum has still managed to retain its #2 rank (via CMC’s designation; its worth noting that $XRP did surpass $ETH in the rankings for a short period of time during September 2018). Thus, it cannot be said that the investors have become too bearish, or it would have at least descended in rank a bit. Ultimately, this article is just the author’s opinion. There will more than likely be individuals that feel differently about Ethereum, and they are certainly welcome to do so. The author embraces the latent possibility that they may have been wrong about their prediction for Ethereum’s price and accepts that they will be duly reminded for months and years to come just how wrong they were if their opinion does, indeed, turn out to be false. In the author’s humble opinion, there just appears to be too many issues to clean up and fix within the protocol in addition to a general lack of clear direction for the protocol at this point heading forward. Statements from leadership (Vitalik Buterin) in recent weeks have carried a markedly more morose tone than they have in months past and it seems that projects are looking for alternatives to either launch their ICOs or ensure that they will not lose all of their ICO profits on Ethereum. Disclaimer: As always, remember that this article is not financial advice. The author is not a financial advisor and is currently divested of all cryptocurrency at this current point in time.